Label ‘Hardy Amies, 14 Savile Row, London W.I. 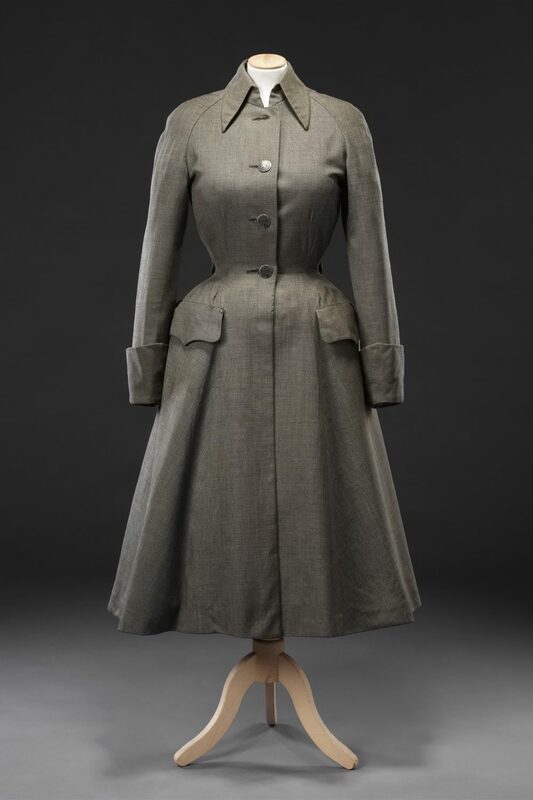 This shapely coat was designed by a pre-eminent producer of couture and ready to wear clothing in Britain during the 20th Century, Hardy Amies. After having worked for the London house of Lachasse during the second half of the 1930s and serving in the Second World War, Amies opened his couture business in Savile Row in late 1945, showing his first collection in January 1946. He was later celebrated for the many outfits he designed for the Queen. 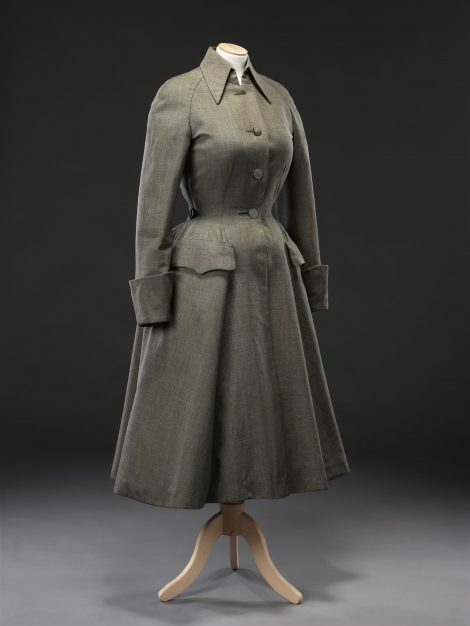 Amies quickly became known for his tailored garments, of which this is a well loved and well worn example from the late 1940s. Its unpadded raglan shoulder line, nipped in waist, and long full flared skirt with accentuated hips acknowledge Christian Dior’s influential debut collection of 1947, known as the New Look. The coat is made of men’s suiting, a fabric Amies used alongside those woven specifically for the female market. This gives it a crisp finish and shape so that its sharp silhouette is achieved purely through expert seaming and the stout canvas lining of the skirt section without the need for padding. 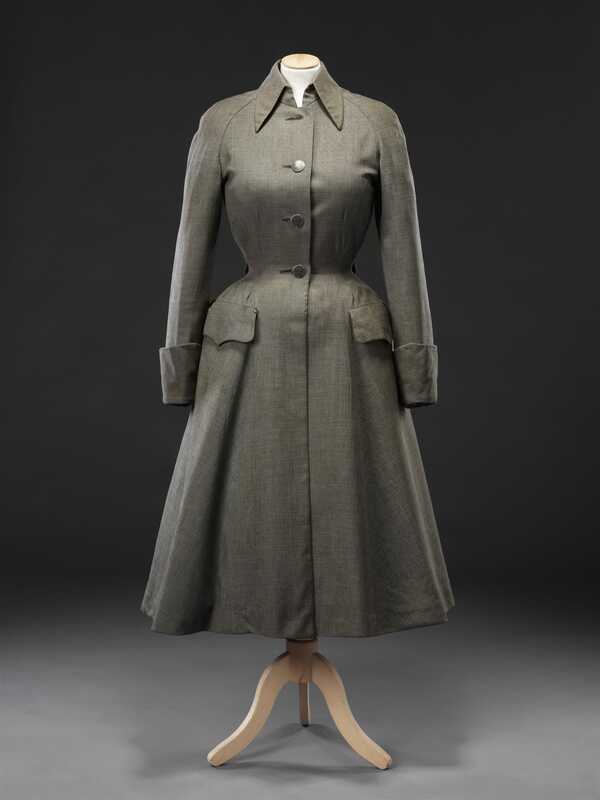 Amies’ coats and suit jackets of the late 1940s show his talent for designing unusual and imaginative collars, cuffs and pocket flaps. 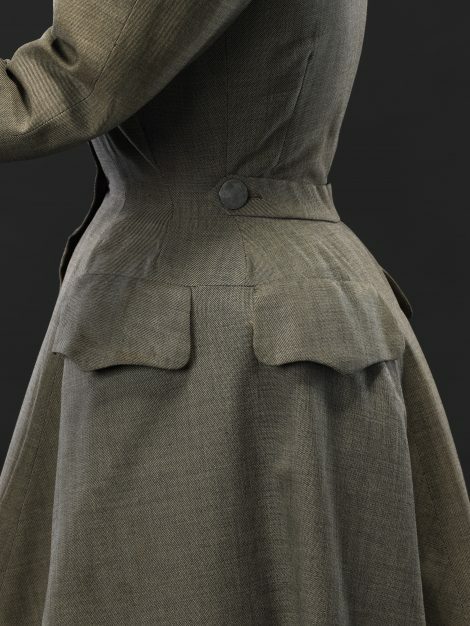 This coat has a pair of identical pocket flaps on each side, one to the front, which is functional, the second to the back on the same level. These help to emphasise the width of the hips. We believe that our coat is the same model as that worn by Wenda Rogerson in her husband Norman Parkinson’s famous fashion photograph in which she and Barbara Goalen look out from the National Gallery over Trafalgar Square to Nelson’s Column (www.npg.org.uk/collections/search/portraitZoom/mw67889/Barbara-Goalen-Mrs-Nigel-Campbell-Wenda-Parkinson-ne-Rogerson). This was published in the March 1947 issue of Vogue with the caption ‘’Bell-skirted coats’, Canvas-lined, they flare out from small waists, sway gracefully as you walk. 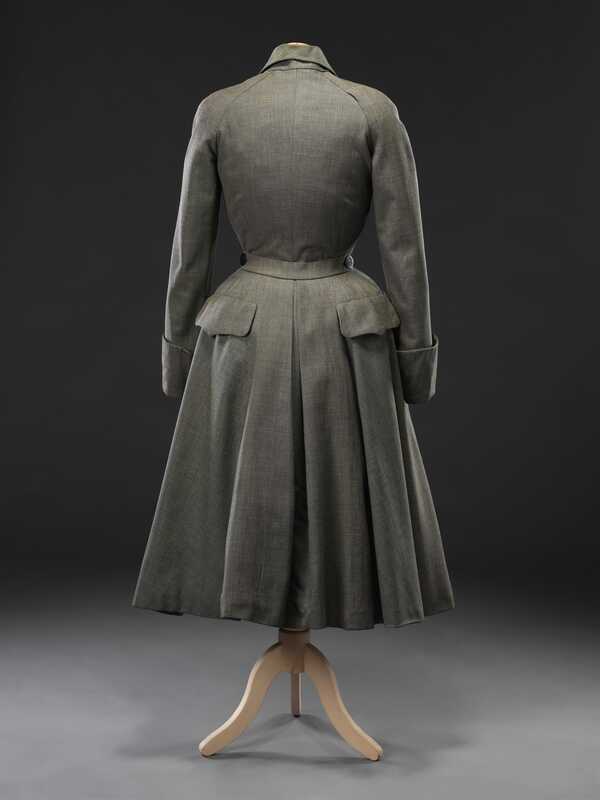 Left: Hardy Amies’ grey coat with two parallel flap pockets on each hip; half belted with unpressed pleat at back’. Although the figures are silhouetted against the light of Trafalgar Square, it is nevertheless possible to make out the high collar, curved raglan seams, deep cuffs, buttoned half belt, and distinctive double pocket flaps of our coat.